Filter is an object which transform the request and response (header as well as content). You can monitor and react to events in a servlet’s life cycle by defining listener objects whose methods get invoked when life cycle events occur. Filters are used for pre and post process requests. Look at the javax.servlet.Filter in your tomcat/jboss/other container javadoc. Where as the listeners are like triggers that can be attached to events in your app server (let’s use the term container here). With listeners you can track application-level, session-level, life-cycle changes, attribute changes etc. The implemented interfaces are javax.servlet.Listener interface. While listeners get triggered for an actual physical request listeners implements javax.servlet.ServletContextListener and other listed listeners. 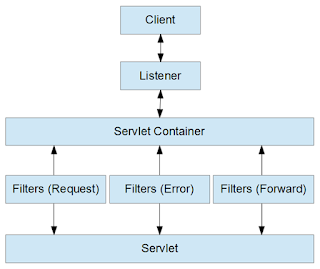 Servlet Listener is used for listening to events in a web container, such as when you create a session or place an attribute in a session or if you passivate and activate in another container, to subscribe to these events you can configure listener in web.xml, for example, HttpSessionListener. Listeners get triggered for an actual physical request that can be attached to events in your app server .With listeners, you can track application-level, session-level, life-cycle changes, attribute changes etc. You can monitor and react to events in a servlet’s life cycle by defining listener objects whose methods get invoked when lifecycle events occur. Event is the occurrence of something, an event can be the initialization of the application, destroying an application, request from the client, creating/destroying a session, attribute modification in session etc. This provides different types of Listener interfaces that we can implement and configure in web.xml. Servlet API provides following event objects. Event that gets fired when the asynchronous operation initiated on a ServletRequest has completed, timed out, or produced an error. Events of this type are either sent to an object that implements HttpSessionBindingListener when it is bound or unbound from a session, or to a HttpSessionAttributeListener that has been configured in the web.xml when any attribute is bound, unbound or replaced in a session. We can use this event for cleanup activities when object is removed from session. Event notifications for changes to sessions within a web application. Event notification about lifecycle of ServletRequest. A filter is an object that dynamically intercepts requests and responses to transform or use the information contained in the requests or responses. Filters typically do not themselves create responses but instead provide universal functions that can be “attached” to any type of servlet or JSP page. The filter is run before rendering view but after controller rendered response. A Filter is used in the web layer only as it is defined in web.xml. Filters are more suitable when treating your request/response as a black box system. They’ll work regardless of how the servlet is implemented. Filters are used to perform filtering tasks such as login authentication ,auditing of incoming requests from web pages, conversion, logging, compression, encryption and decryption, input validation etc. public void init(FilterConfig config) init() method is invoked only once. It is used to initialize the filter. request to any resource, to which the filter is mapped. Servlets are programs that run on a Web or Application server and act as a middle layer between a request coming from a Web browser or other HTTP client and databases or applications on the HTTP server. 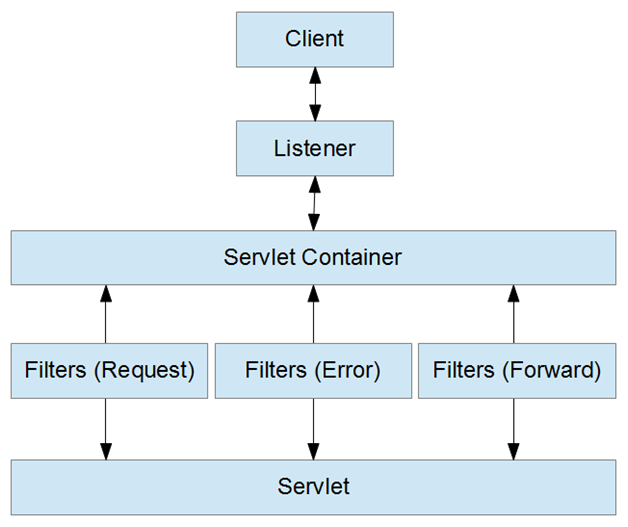 A servlet is simply a class which responds to a particular type of network request – most commonly an HTTP request. Basically, servlets are usually used to implement web applications – but there are also various frameworks which operate on top of servlets (e.g. Struts) to give a higher-level abstraction than the “here’s an HTTP request, write to this HTTP response” level which servlets provide. 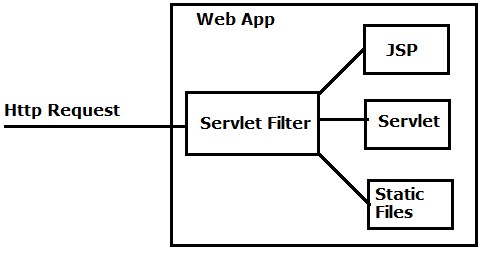 Servlets run in a servlet container which handles the networking side (e.g. parsing an HTTP request, connection handling etc). One of the best-known open source servlet containers is Tomcat. The container will take care of things like wrapping the whole thing in a HTTP response object and send it over to the client (say a browser). Servlets are now java classes whose lifecycle will be maintained by the container but their reaction to incoming HTTP requests will be decided by you. You do that by writing what-you-want-to-do in the pre-defined methods like init(), doGet(), doPost() etc. When a Servlet is requested for the first time or when the web app starts up, the servlet container will create an instance of it and keep it in memory during the web app’s lifetime. The same instance will be reused for every incoming request whose URL matches the servlet’s URL pattern. You can access the requested data by HttpServletRequest and handle the response by HttpServletResponse. Both objects are available as method arguments inside of any of the overridden methods of HttpServlet, such as doGet() to preprocess a request and doPost() to post-process a request. See also How do servlets work? Instantiation, sessions, shared variables and multithreading.